The Uncanny Valley is a pit of doom for robots, few that dare enter its depths will ever emerge again. 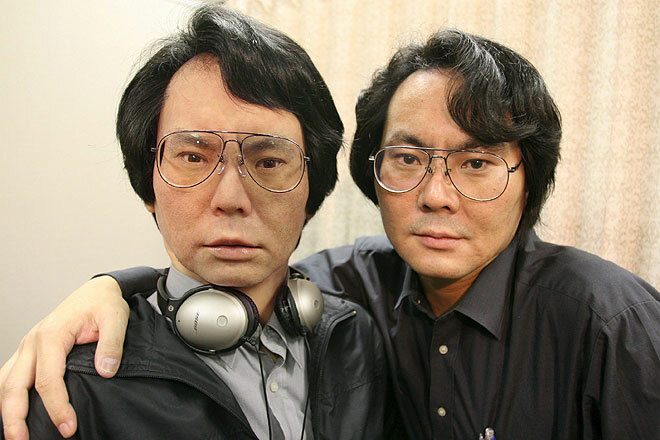 Yet the latest realistic robot from genius Hiroshi Ishiguro is as close to spanning the valley as any machine I’ve seen. 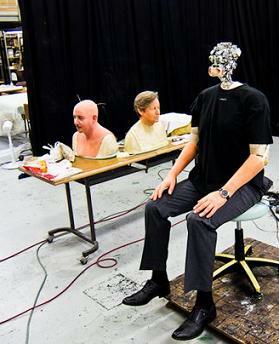 Referred to as Geminoid-DK, the robot is a replica of Henrik Sharfe of Aalborg University in Denmark. This thing is amazing looking. Unlike many previous Geminoids we’ve seen in the past, Sharfe’s robotic copy is almost real enough to pass as human. Almost. Movements and expressions aren’t quite there yet, but when it’s sitting still – wow, this robot is getting close to the goal. Check out Geminoid-DK in the videos below and see if you agree. From some angles this guy is creepy, from others it’s nearly friendly. Geminoid-DK shows that the aim of creating a life-like robot that humans can accept may be nearer than we think. The smile in this clip is amazing. The onlookers have reason to giggle. Built by ATR and Kokoro in Japan, Geminoid-DK is the first model of Geminoid to be hosted outside of Japan. 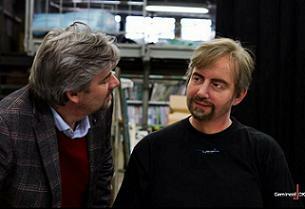 It will be used at Aalborg University by Sharfe and his colleagues to explore human-robot interaction. According to their website, the university’s Centre for Robotics Research will aim to answer the following broad philosophical questions: What is a human? What is presence? What is a relation? What is identity? I’m clueless as to the details of the experiments the team hopes to run, but I can guess that Geminoid-DK will be spending quite a bit of time meeting and communicating with visiting humans to judge their reactions. Will people treat Henrik's Geminoid as an extension of him, or as a separate entity? In other words, a robot is often seen as a separate entity even when it’s a copy of you. Photos, videos, and other recordings aren’t treated that way. In fact, as we learned when talking to Fred Nikgohar of RoboDynamics, non-humanoid looking telepresence robots aren’t treated this way either. After a few days of a telerobot being around an office, it’s referred to as the user (just as you would with a phone call). Is it the robotic nature of a machine, or its human-like presence that causes us to view it as an individual? It should be really interesting to see what Sharfe learns by blending his own presence with that of his Geminoid copy. The final big topic that Aalborg University hopes to explore with their program is understanding how cultural differences impact human-robot interaction. The Geminoid series of bots was created by Ishiguro in Japan, and the previous incarnations of the robots (produced with ATR and Kokoro) were all Japanese in appearance and primarily presented to Japanese audiences. Japan has a rather famous love affair with robots. Less so for the Danish. Will Geminoid-DK face a more critical environment in Europe? Maybe so. Now there's the creep factor I'm used to. As many answers as the Geminoid-DK project will generate, I’m not sure the robot itself represents a great technological achievement. You can see fleshless versions of the bot on its Facebook page, and none of the press seems to indicate that the armatures have been improved greatly over previous models. Yet if it’s not more sophisticated than other robots, Geminoid-DK still manages to be a better illusion in my opinion. How? I’m not sure. 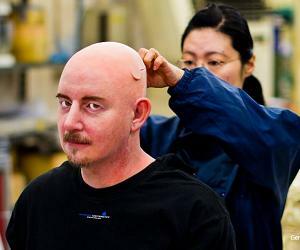 It might be that the face-molding and hand-molding procedures used on Sharfe (seen in videos here and here) have been improved. Certainly the eyes are amazing, and we know how important eyes are in human-robot interaction. It could be that each Geminoid is a piece of art and some are simply going to be better than others. It might be that the copy of Sharfe actually isn’t any more real than earlier models of Ishiguro himself, it’s just that I’m more used to European faces than Asian ones because I grew up in Texas. Technique, art, or culture – hopefully Sharfe’s research will determine which is the driving factor of his clone’s success. Geminoid-DK looks to be an illuminating device in helping us learn about human-robot interaction, but we should keep in mind that practical applications are probably far from near. Watch the replicant move and there’s little doubt that its realism is drastically impaired when active. Previous models, like the Actroid F, have been proposed as telepresence robots that allow us to better connect to distant users, but I’m not really buying into that idea. A picture from a webcam is infinitely more approachable at this point. No, I’m pretty sure that Geminoids are still best suited to research for the present. In the future, however, I think that it’s almost certain we’ll create robots that finally manage to cross the Uncanny Valley in appearance if not personality. Take a good long look at Geminoid-DK. It’s not human enough yet, but give it a few years and it might manage to fool you with its face. A few more years beyond that and it might fool you with its voice and motions as well. Hurry up and find those answers, Henrik, we’re getting into some crazy territory really fast.